The latest feature in Season will allow you to create consignment orders or “works,” orders for Season Factory. This is for companies who produce bulk orders over a number of days or weeks. Consignment Order – This is where an operator wishes to ship part of the order and reduce the overall quantity of that order. Designed specifically for businesses who deal with large bulk orders that are delivered over a period of days / weeks. 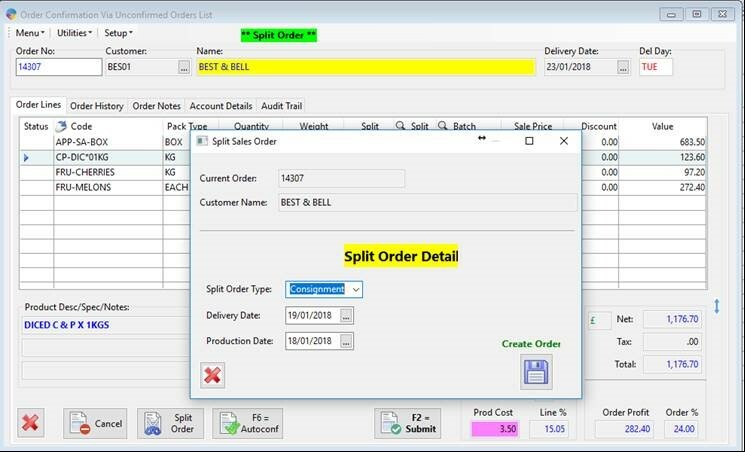 Works Order – This lets operators split an order to create an internal works order for production without reducing any quantities on the original order. Season will automatically create the jobs in Season Factory for operators to work on. 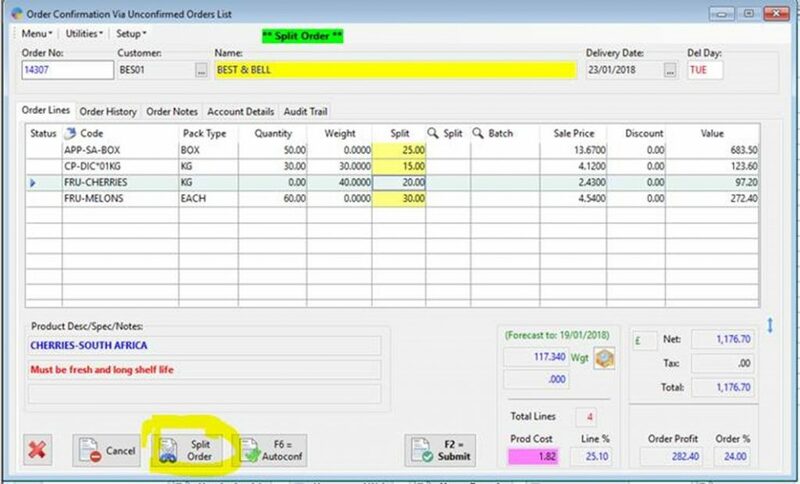 The operator has entered the split quantity in the split field by clicking on the Split Order button (highlighted image 1) during order confirmation. They then submit the order as normal. 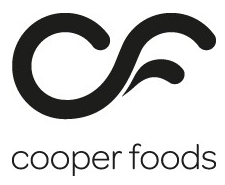 Upon submission operators are required to select their split order type and a delivery date or production date based on whether it is a consignment order or works order. In this example we have chosen Consignment to ship part of this order on 19/01/18 with the remainder to be shipped on the 23/01/18 visible on the original order. There will now be two orders in the system under the unconfirmed orders list for this customer and they are linked by the order number. The original order number is 14307, the split consignment order will be 14307B and will have a delivery date of the 19/01/2018. This will be communicated with the Factory upon confirmation to allow them to pick and ship the order to meet the delivery dates. The Works Order follows the exact same format except you would select the Production Date you wish to make the product/s. This will automatically create the Jobs in Season Factory for operators to begin working. The quantities on the original order will not be affected. This serves as a production planning tool that allows you to create jobs efficiently and plan what to produce for what orders incredibly useful for large bulk orders. These features are in development and will be released along-side Season 18 which is due for release Q1/2 of 2018. If you think your business could benefit from these features get in touch today for a full demonstration. Send an enquiry to sales@datos.co.uk or give us a call on 028 38 362002.